Twenty years ago I was looking for a Universal remote that works, I mean really works and I ended up building a home theater and automation business as a result. The truth is they didn’t work unless you had special software and had training on computer programming. Still I knew there had to be a better way than four remotes on the coffee table. Since the home theater stores are now in better hands, I don’t have access to the really CoolToys at wholesale prices. My search for a Universal Remote that works started again. This time I stumbled across the Logitech Harmony One at Costco. Given the return policy at Costco I figured it was worth a shot. When I opened the box, I had a remote, a charging dock and a USB cable to connect to my computer. My regular computer is a MacBook Pro which uses the newer USB-C connectors. I ended up using my old MacBook Air which had the correct USB connection points. It was easier than digging through the miscellaneous cable box in hopes of finding a cable that worked. All I did was plug the remote into my MacBook and go to MyHarmony.com. I created an account, and entered my devices one at a time. The only one missing was the ReQuest Media Server, which any one who knows me knows the ReQuest is my favorite home gadget. After a week of using the Logitech Harmony One without a glitch, well ok one glitch. I walked in front of it when my wife was turning everything off. Anyway, I decided it was time to do something super cool in my screening room. Movie award voting is in full swing and the DVD’s are piling up. Logitech sells a gadget which on the surface was the super winner. The Harmony Hub. The Harmony Hub uses wifi and an iPhone to control the Audio Video System. When I had the home theater stores a touch screen remote could cost $7500 or more with programming. Here was a DIY product that would even let me re-use an old iPhone! After I got the Harmony Hub programmed, it was in fact a Universal remote that works. The problem was my fat fingers. The reason I upgraded my iPhone 4 to a 5, then 5S and now an X is my fat finger don’t do well on small screens. After a few days of fumbling with the iPhone 5S as my screening room remote, I decided I needed something bigger. My wife wanted a new iPad, soooooo, there it was. I bought her a new iPad and used hers as the screening room remote. That wasn’t bad for a day or two, but then I tried to watch some DVR’d TV. The touch screen had no feedback or tactile feel. That is the one thing those $7500 remotes have. It is also what the basic Harmony down in my living room has. The other thing I found is that the number of devices it can control is limited unless you also have the remote. What? So back online I went. Eventually I sucked it up and bought the Harmony Elite. 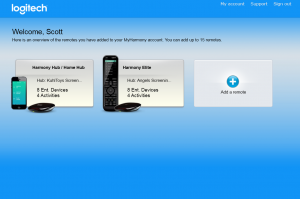 This appeared to be the best Harmony remote a Harmony Hub that are designed to work together. When it arrived it was exactly that. I was able to program it in less than 10 minutes. I tried to copy my old hub programming to the new hub but no luck. The the Elite in hand I started testing. Very quickly I could see I had a remote with a couple of problems. First the touch screen is much smaller than the Harmony One for some reason, and second it was missing the “Jump forward” button. This is critical to watching DVR’d TV with any speed. For now the Harmony Elite is better than the Hub, but ergonomically not as good as the Harmony One I picked up at Costco. Ideally I would like the Harmony One with a Hub for my Screening room. For now I have a hub in the box solo, the Harmony Elite with Hub in the screening room earning a B+ and the Harmony One in the living room getting the A. Yes there are Universal Remotes that work and are easy to program if you have a laptop and internet access. Which one you choose will determine how much functionality you get. Look Closely before you buy. I may have an Elite for sale soon if I get a Harmony One with Hub. I might just be too cheap, so we’ll see.